We are really pleased to finally be sharing the results of our winter renovations with you. One of the commitments we have to the house (and one of the perils of owning an old house) is renovation. There is always something to redo. This winter is was the draw of two large nursery rooms and a bedroom and bathroom in the west wing of the house, to provide more accommodation for guests coming to stay. With more couples choosing to hold their wedding here at Pennard House over 2 days, including an informal ‘night before’ dinner in the dining room before the wedding, we wanted to be able to accommodate more close family and friends on site. We wanted to be able to use these new rooms for guests, which meant we needed to modernise the space as well. So we equalled out the rooms to create three spacious, light bedrooms each with an ensuite bathroom. The great thing is also that these rooms have a dividing door which separates them from the main house, as well as their own access via the separate ‘back stairs’. An ideal combination for any brides and grooms wanting to keep with tradition and spend the night before apart, whilst still being on site. We’ve filled each room with furniture in keeping with the style and age of the house. The rooms, we feel, are a great addition to those already available at Pennard and a natural extension to the comfortable and homely feel of the house. Below we share some of the details for each of the rooms. We hope you’ll have a chance to see them for yourselves sometime soon. A former nursery room with large bay windows and panoramic views over the park, we completely refurbished the room and added an ensuite with a large walk in shower and Burlington sanitary ware . 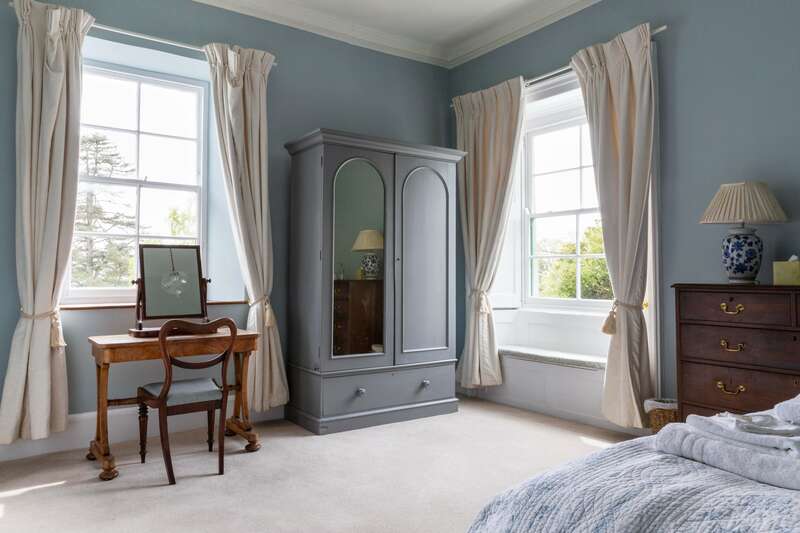 To make the most of the large bay window and allow as much light to reflect around the room as possible, the walls are decorated in Farrow and Ball paint Slipper Satin. We wanted to give an ode to the age of the house and included some subtle Victorian panelling on the walls, and sourced bespoke cornicing to match the original features of the room. The vintage chandelier is the perfect centrepiece to bring it all together. We love the two bed side lamps from Jim Lawrence. 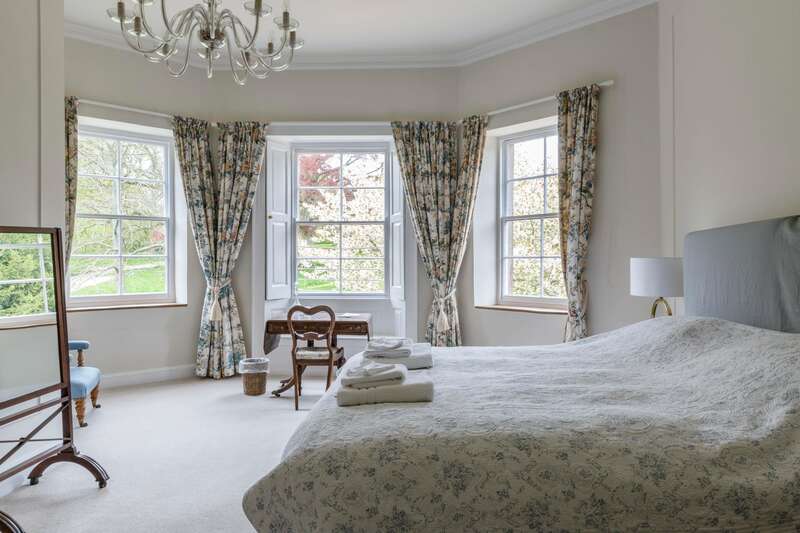 This is a large double room with views out to both sides of the grounds, complete with an ensuite with a large walk in shower. We love the combination of colours in this room. The cream curtains and the Farrow and Ball ‘Parma Gray’ colour on the walls. The combination is elegant, cool and makes for a wonderful setting for photographs or a lovely long morning in bed! The lights we chose again from Jim Lawrence are in keeping with the white and the blue theme. 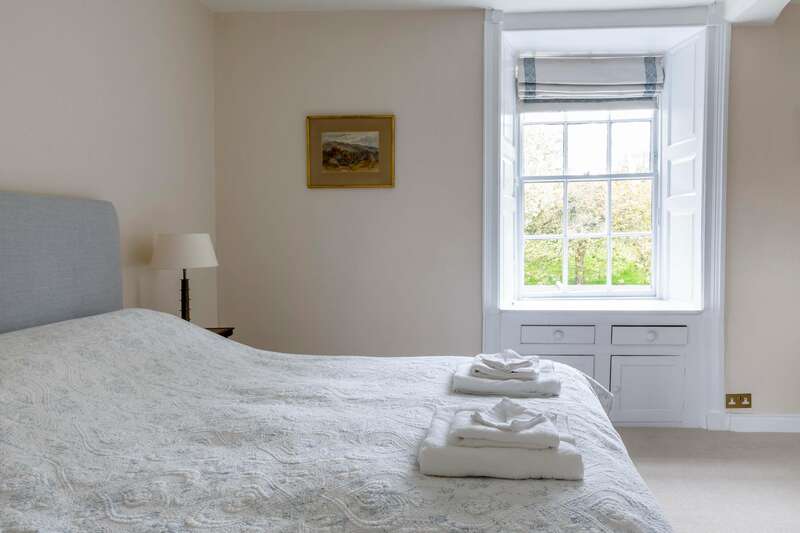 Once the housekeepers room, this is now a comfortable double room with a large bathroom, a big walk in shower and roll top bath. There are some lovely features in this room that we didn’t want to take any attention away from. The window seat, and the light that comes through it, and the simple features elsewhere so we chose a simple colour, Farrow and Ball ‘Dimity’. We had the blinds made to measure for the window to match the headboard and wall colours. In the bathroom however we wanted to add some really unique features. We still love the hand painted murals that we have in the Bridal Suite and we wanted to do something similar. Rather than copy it though, we found some amazing wallpaper from Sandersons. It’s like bringing the outside into the bathroom. 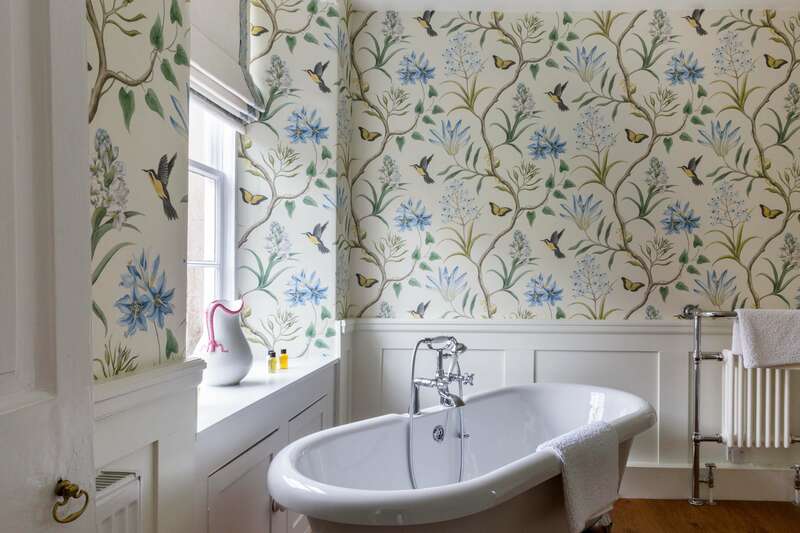 All you need to do is fill the roll top bath, relax and feel nature all around you. For more information on exclusive hire or to arrange a viewing at Pennard House please do get in touch.